Samsung brings another new budget smartphone in Bangladesh Galaxy A10. 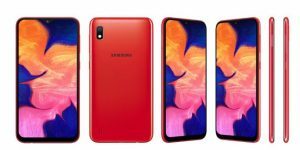 Last month Samsung Bangladesh introduced us Galaxy M10, it was another budget smartphone and got huge success in Bangladesh market. Samsung Galaxy A10 comes with 6.2 inch IPS display and built with a plastic body. The device has 2 GB of RAM and 32 GB of native storage, you can also expand it up to 512 GB via microSD card. It camera feature is 13MP single primary and 5MP front-facing camera sensor. The phone runs on One UI operating system based on Android Pie 9.0 and powered by Samsung own Exynos 7884 Octa chipset. Samsung Galaxy A10 is fully loaded with 3400mAh battery that will provide 26-hour full backup. The device support FM Radio, Hotspot, Headphone jack and many more. The phone looks very stylish and trendy. It’s available on Black, Red and Blue color. Samsung Galaxy A10 price is BDT 11,990. So the price is very competitive and fair. If you have 12K budget than the ‘Made in Bangladesh’ tag Galaxy A10 will be a perfect one. or you can find all mobile phone price in Bangladesh within this budget.